Charles: "And this as you can see is the candle collection." 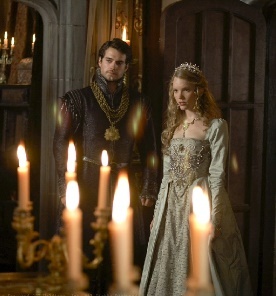 Charles: "Watch out, this chamber makes you burn...I feel a heat on my head"
Katherine: "I feel paralized, your Grace." Charles: "Yes, yes, that is a normal reaction seeing the King doing his exercises in the morning." Charles: "And this is your chamber, my lady. The one your cousin had before..."
Katherine: "...And me, who was hoping that my cousin was beheaded for something better than this..."